After just 9 months, my team and I showed off a new breed of high-octane multiplayer real time strategy game, where players fight monsters, transform robots, and mutate creatures as the dieselpunk Knights of Teutonia, or the chic, futuristic Alchemists of Regalis. And I couldn’t be more proud. Writing about Spring Demo Day with The Maestros after the fact cannot convey all the feelings I had that day. However, the motif of the day still resonates clearly when I watch this video. The theme was 45 different people coming together when it counted and making their own, immensely significant contributions – be it with their humor on stage; with their well-timed play in the match; with their presence promoting the game online for playtests; or in their work on the game itself. 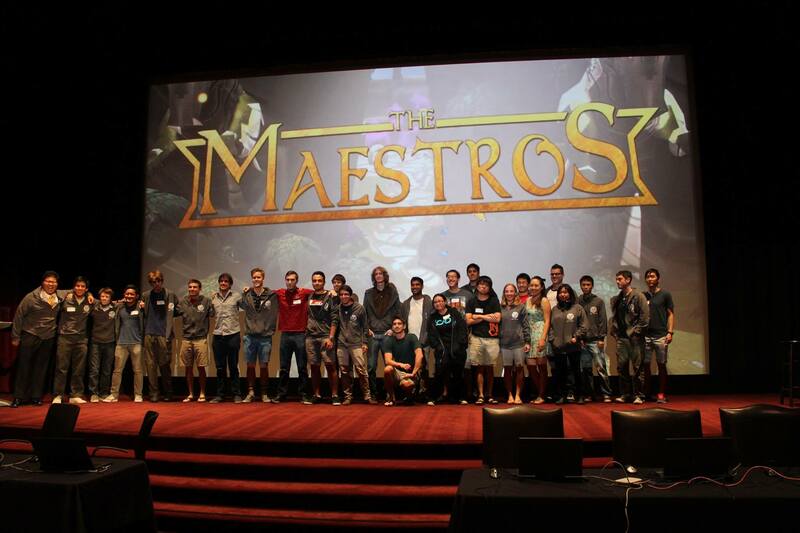 Coming into USC Games Spring Demo Day, The Maestros was definitely suffering from a lack of time and energy. In addition to it being our final showcase of the game as a “school project” (oh how quaint that sounds in the context of how much energy went into this game), most of our team was graduating from university. All of our team was searching for jobs, internships, and places to live for the next several months. To top it all off, we were really only just coming off of our crunch for the Game Developer’s Conference (GDC) in San Francisco. We all agreed that the game was really in a great place coming out of GDC. We had an awesome little public alpha trial, people enjoyed the game, and we got lots of good feedback. However, we were committed to going even further. We wanted to do something bigger. Everything up to that point in the semester had led up to adding the second playable race, The Alchemists of Regalis. Over half of our content was created specifically for that purpose. Unfortunately, with a clean GDC build being our main focus all the way through March, the Alchemists got neglected, and didn’t see real play-time until mid-late April, far later than we wanted. There was definitely pressure, from our advising professors and others to cut the Alchemists all together. The pressure was hardly unfounded. At that point in a project, time should be devoted to polishing existing content and user experience. For me, and I know for a lot of others, the whole goal of the project was to go beyond creating a slice of a good game, and actually make something that felt ready to be put in the wild in some capacity, and an RTS game with a single playable faction simply did not feel that way to us. At the time, I was confident that if we moved quickly enough with the second race, we would have time to get them in good shape and round out any polish work we were doing. On top of that, everything we had built infrastructure-wise with our build system and swapping game versions through a patcher was created so that we could confidently go forward knowing that we always had something to fall back on. So the decision was to press on. The Alchemists definitely got done, but things were very contentious on the quality of the faction as a whole very close to the end. This should have been and was, to an extent, an expected issue, given that we had less time to play with them. I’m very proud to say that we massaged them into a fun, and totally unique experience for Spring Demo Day. The other thing that happened though was amazing, and I still don’t fully understand it. As we got closer and closer to the deadline though, these totally unprovoked improvements kept rolling in that, when combined, really flipped a switch on the look and feel of the game. All the sudden sloppy controls felt tight and responsive, and the feedback went from adequate to juicy. As a person who had played the game for months, it made a world of difference, but the reasons were completely imperceptible. Updates to the attack-idle-move cycle allowed for more precise kiting, subtle coordinated movements within groups made for a more digestible, orderly army movements, and more particle effects combined with updated animations to bring more clarity to action and more life to the world. It was really cool to see what happened when I could say “yes” to ideas that late in the project, knowing definitively that the worst that would happen would be that it wouldn’t make it in (as opposed to affecting lots of prior work in ways we couldn’t untangle). As most projects probably say, we didn’t quite do everything we originally set out to do. In our case though… we got pretty damned close, and I’m incredibly proud of that when I also consider the quality of the work. I’m especially proud when I consider that there were more than a handful of people who thought we couldn’t even get the basics down, and further considering that halfway through, we almost didn’t get those basics down (before the Herculean effort of this amazing team delivered in literally every category for our first demo). Rather than trying to capture the scope of this endeavour for a bunch of students and hobbiests, I’ll direct you to the statistics here: The Maestros by The Numbers.